The perfect Rocky Mountain location for romantic bed and breakfast inn getaways, family reunions, vacations, and business retreats. 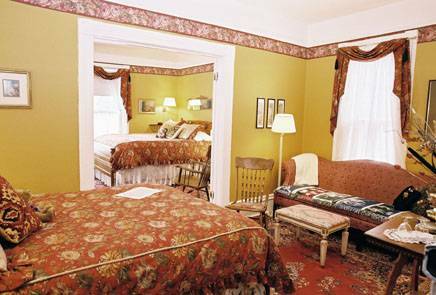 Large sunny rooms and private cottages await your arrival and welcome you to this Colorado bed and breakfast inn. Located in Cascade Colorado, these Colorado accommodations are just minutes away from all Manitou Springs and Colorado Springs attractions and across the valley from Pikes Peak. Eastholme can accommodate up to 26 people and is ideally suited for conferences, reunions, workshops, receptions, and retreats. Guests enjoy a full gourmet breakfast with freshly baked breads, pastries and culinary delights such as delicate souffles and hearty frittatas. Cabin Rentals ~ Great Rocky Mountain lodging for your Colorado honeymoon vacation. Very romantic cabin rental includes three rooms with whirlpool bath with hand held shower, stone gas log fireplace. Sleeps 1-4. Queen bed and good queen sofa bed. Relax on the outside deck of this vacation rental. This charming 1885 Victorian beauty listed on the National Register of Historic Places and nestled in the Pikes Peak mountain village of Cascade. This is the perfect headquarters for a Colorado vacation or quiet business retreat. Located just six miles west of Colorado Springs, only fifteen minutes from downtown, Eastholme is midway between the Air Force Academy and Cripple Creek, making it convenient to any destination. Six course gourmet dinner prepared by our chef and served in your room. Romantic setting. All cancellations are subject to a 10% fee. If occurring within seven days of reservation, there is a 50% fee. Same Day 100%. From I-25 take exit 141 (Hwy. 24 )west. In approximately 11 miles exit right at the "Cascade" exit. Drive 1 1/2 blocks and turn right on Topeka. Go 1 block to Haggerman. Eastholme is on the corner on your right.